LinkedIn is a social media platform. It connects professionals across industries. It’s rich in networking. Its references serve as a tool to hire professionals. It is used by large corporations. It has grown enormously to a near 350 million users. It lets the professionals share content. The content is shared in their network. It brings the knowledge-base to the professionals. It lets its users share many types of content. It has set a social platform for professionals from multiple domains. It is more unique. It targets B2B rather than the B2C models. It lets corporations promote their content. They also promote services on its site. It lets them attract talents. It endorses the skills to perform the job. It enables the companies to promote their products. It helps them to reach out to other businesses for partnerships. Its revenue has grown manifold. It’s steering its B2B strategy for growth. It has contributed to the companies. It helps transform their employees to share the knowledge. It brings in a greater benefit. This is achieved by sharing information. It is useful to marketing professionals and analysts. What Elevate is all about? It continuously revises its business growth strategy. LinkedIn reaches into new areas. It acquires new avenues of businesses to foster its growth. It has been diverted to a social media management business. Its acquisition of companies caters to most of its content management businesses. Elevate is one such acquisition. It puts LinkedIn in limelight of content. Elevate aims to let the users share articles. It is based on user profiles, preferences and prediction algorithms. It is based on services such as Newsle and Pulse. It transforms the mind of a professional. It builds into vast library. It helps sharing of common articles. It also helps to share blog posts and other reports. They are much used in marketing analysis. The beauty of the elevate app is that it caters to many domains. It enhances the professional community to benefit a lot. It aims to get knowledge by giving it. It comes with eccentric features. Seamless sharing is one of them. It enables content to be shared across devices and multiple mobile platforms. This lets professionals on iOS, Android and Blackberry platforms to seamlessly share. They provide perceptions of the articles that impart the need. Its extensible feature includes sharing on other social media sites. They include as Twitter and Facebook. By integrating this app into other social sites, the users become social professionals. This has proven that we witness an information revolution. What becomes more of interest in sharing is the analytics part. 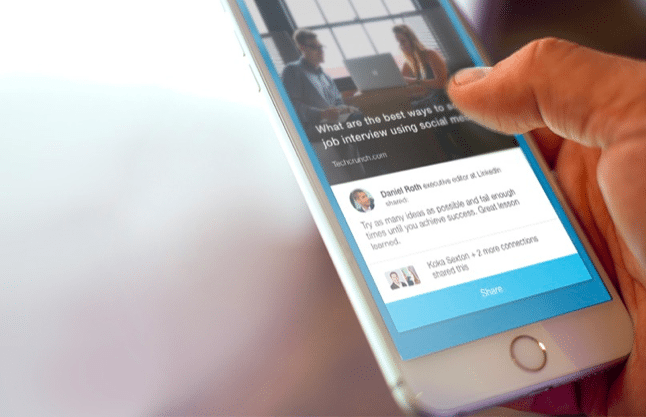 The LinkedIn Elevate App provides deeper insights into the analytics. The analytics are useful to the companies. They can see the number of views per article. They can view most preferred article. It provides ranking of information. It provides re-sharing count of articles. The users can see comments and reviews. It is vital for marketing geeks. It helps to collect a consumer survey before they go bang with a product launch. These analytics help the Human resourcing firms. They can view their job posts views. They can see the demand in a certain industry. It gives a trend of the salary and compensation for certain skillsets. They can act accordingly. Elevate is certainly a great app. LinkedIn has integrated it in its ecosystem. It aims to elevate the knowledge of the employees. It is geared to raise the social connection of companies and professionals.